At this watershed time, and even as Iran threatens to attack Israel, supernatural shakings are loosening strongholds of anti-Semitism and could help release revival in the region. 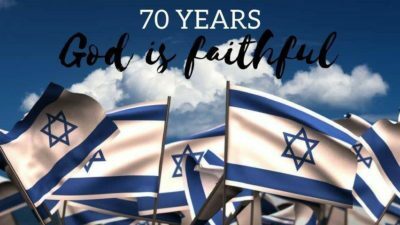 We have been gratefully celebrating 70 years of God’s covenant restoration of Israel the past few weeks. Festivities formally began, according to the Hebrew calendar, on Iyar 5 (April 19) and continue through May 14, the Gregorian calendar anniversary. Record-breaking numbers of Christians from the nations are here to participate in the historic events. One remarkable shaking we see concerns the global stronghold of anti-Israel sentiment. God is graciously providing opportunities for profound change, even turnaround, between Israel and some nations. These opportunities may coincide with difficult circumstances. But as intercessors pray in the Spirit with authority, global shakings will result in more and more nations aligning with His Kingdom purposes. We believe this may well include a long desired release of revival in Israel, Iran and Palestinian territories. To more accurately discern what God is doing, it is important to view the present in light of Israel’s past 70 years, together with her future and biblically-based destiny. Recall that 70 years ago, the Jewish state was mostly barren swamp, desert and waste land. Hours after her birth, the disorganized and traumatized country was cast into her life-or-death War of Independence. Thousands of immigrant Holocaust survivors arriving off boats were handed rifles and a day’s rations, and with no military training, sent to defend against Arab armies promising our quick defeat. To the world’s surprise, Israel won the war. Israel’s restoration is the Lord’s doing and it is marvelous in our eyes. (Psalm 118:23) From 1948 to 2018, the tiny frontier land survived nearly 10 wars and intifadas. Miraculously, during that same time, her tents expanded as she prospered and thrived. She blessed the world with God-inspired technology and other innovative solutions to the problems of humankind. Today, Israel is recognized as a leading world power in many respects. Israel marks its 70th anniversary of statehood, according to the Hebrew calendar. Violent Palestinian uprisings begin at the Gaza border, refueling global anti-Israelism. PM Netanyahu reveals an Iranian drone recently downed in Israel was armed; Israel defensively/preemptively bombs Iranian outposts in Syria. Palestinian President Abbas bizarrely discloses his anti-Israel intentions and is written off as a serious leader by much of the world. 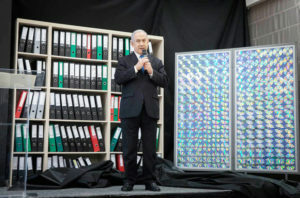 PM Netanyahu openly displays documents evidencing Iran lied about its nuclear intentions. Israeli officials announce Iran is preparing an imminent military strike on Israel. President Trump’s decision to withdraw from the Iran deal will likely impact the world, especially Israel. Jerusalem Day (Yom Yerushalayim) culminates Jerusalem’s 50th (Jubliee) anniversary on May 12-13. On May 14, Israel will mark its 70th anniversary according to the Gregorian calendar, the same day the US plans to relocate its embassy to Jerusalem. 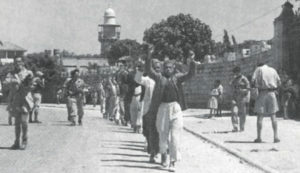 Ramadan, a time of heightened spiritual and often natural warfare, starts May 15, which is also Nakba Day, the Palestinians’ annual day of mourning and cursing Israel’s independence. 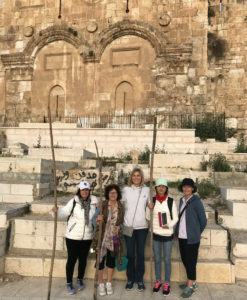 Large numbers of Christian prayer groups arrive from the nations to intercede for Israel in April-May, as unseasonal, deadly storms strike the country. Shavuot (Pentecost) takes place May 19-20. Now, despite the unfolding of events listed above, we believe the future rests with the intercessors! (Jeremiah 18:7-10) As you read the last portion of this article, we encourage you to take a moment to be refilled with the Holy Spirit, then decree His desired fulfillment of the Scriptures noted, praying the points shared below. 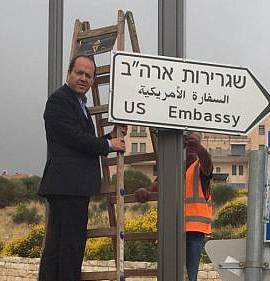 The mayor of Jerusalem posts a new street sign on May 7. 4. We believe God has a peace plan in mind and heart cconcerning the Palestinian-Israeli conflict—and we’re praying into it. He loves the Palestinian people no less than other people groups. If He is giving other nations an opportunity to align with Him and with Israel, would He not also graciously provide Palestinians with an opportunity as well? Is not the New Covenant sufficient for their redemption, too? Could not the Holy Spirit visit them in power, bring down the current evil and unjust leadership, free the people to worship YHVH, and quell hatred for Israel? Please pray accordingly. 5. Prime Minister Netanyahu, who has in many ways served Israel extremely well, cannot serve forever. He has publicly intimated he may not seek reelection when his term expires in late 2019. (However, Israeli politics being what they are, new elections could take place anytime.) We are asking God to prepare Netanyahu’s successor, to align our government with biblical righteousness, and to install a new prime minister—in His time—who will serve His purposes. Mr. Netanyahu has made many divinely inspired, good choices during his long term of service. Unfortunately, he has also made some choices that have significantly strengthened ultra-Orthodox Jews who are vehemently anti-Messianic. In a real sense, these individuals serve as Israel’s official gatekeepers, denying aliyah to Messianic Jews and entry into the country to some Christians. In effect, they are saying, “NOT blessed is he who comes in the name of the Lord.” We ask you to pray this will change, for the good of Israel and the nations. 6. In recent weeks, Israeli officials and analysts have admitted we are in a de facto war with Iran. Intelligence and other officials are indicating preparations are underway, on both sides, for an imminent military confrontation. We do not believe the divine time is yet for the apocalyptic battle described in Ezekiel 38-39, which strongly implicates Iran. In that passage, God Himself is clearly the One who instigates a collective assault against Israel from the north. We sense He is not inspiring a regional conflagration in this current conflict. Demonic powers, however, seek to mimic and hasten destruction. They strive continually to annihilate the Jewish people. So any potential combat with Iran is reason for fervent prayer. Netanyahu’s public exposure of Iran’s nuclear intentions last week was addressed as much to the nations as to Israel. This includes Iran itself, which suffered severe humiliation by the display of smuggled goods. In Islam, such extreme humiliation necessitates retaliation or revenge. We believe God wants to set the good people of Persia/Iran free, greatly increase the spread of the Gospel in that land, and if possible, transform them into a sheep nation. To accomplish this, He could allow limited military operations between Israel and Iran to occur. According to Jeremiah 49:34-39 (which already came to one fulfillment in ancient times) and Isaiah 19, He allows and uses limited destruction to magnify Himself in Iran. Could we not pray for another merciful, at least partial fulfillment of His Word? Bear in mind that Russia may be the power broker nation and wild card in the future of Iran and the Middle East. Pray for Russia. May God break unholy alliances between her and Iran, Syria and Turkey. 7. The quantity and quality of Christian intercession taking place in Israel at this time is staggering. Prayer groups from the nations appear to be posted all over the country, standing in the gap on our behalf. Personally, we are awestruck at how God has mobilized the international Church in the past 15 years to pray for Israel. 8. Thanks be to Him for calling faithful reinforcement troops at this watershed moment of our history! We need them (and you) to not only stand with us, but to teach and impart to us. Meanwhile, we pray and release, in Yeshua’s Name, protection, anointing, every needed resource and radical fruitfulness over you all!